A dam is usually constructed across a river to create a reservoir in the valley behind by storing the water that flows into it naturally. Sometimes, they are built across dry valleys, or valleys with small streams, to create a storage area for water that is transported from elsewhere. Streams and rivers have to be diverted to create a dry area to construct the dam. 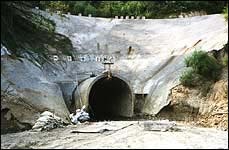 Small rivers and streams are usually diverted through a tunnel, or a channel that is constructed around the side of the dam. Soft soils and rocks are excavated to form the route, while harder rocks have to be blasted with explosives. Sometimes, dams are built across wide rivers with large volumes of flowing water. It would be impracticable and too expensive to construct a separate channel to divert the water. Instead, a dry construction pit is formed on one side of the river, leaving the other side open for the water to flow through. 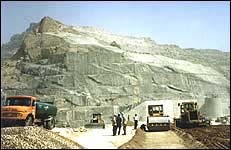 The first portion of the dam is constructed in the dry pit. When it is finished, another dry area is formed on the other side of the river, and the remaining part of the dam is built. Meanwhile, the river flows through openings in the completed portion of the dam, and the reservoir can start to fill behind it. Find out about the construction sequence for the Three Gorges Dam that is being built across the River Yangtze in China. A dam is built on a soil or rock foundation, depending on the type of dam. The foundation must be strong enough to carry the weight of the dam, and the water pressures acting on the dam. The dam foundation is below the original ground level. It is covered by weaker soils or rock that have to be removed either by excavation or by blasting with explosives. Some rock foundations have cracks and fissures in them. These have to be filled with grout to stop water leaking out from the reservoir through the cracks once the dam is completed. This is done by drilling holes down into the rock, and by pumping grout into them, which spreads outwards to fill the cracks. As so much concrete is required in a concrete dam, it is mixed together in a special building called a concrete batching plant, which is built on the construction site. For very large dams, there may be a number of batching plants. The concrete can be placed in the dam by two different methods. The traditional method is to pour a wet mixture of concrete into a mould made in the required shape of the dam. The mould, called formwork, is usually made from sheets of timber. 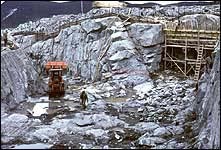 The mould is not made to the full height of the dam, as the dam is built upwards in stages of about 1 to 2 metres at a time. The concrete is left to dry before the next section is formed on top. 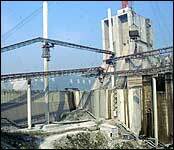 The concrete can be transferred from the batching plant to the dam by a number of methods. Sometimes, a system of conveyor belts is used and sometimes the concrete is taken by trucks to the bottom of the dam where it is poured into skips which are lifted to the top of the dam by cranes. Roller Compacted Concrete (RCC) dams are formed by spreading a drier of mix of concrete and compacting it down using rollers. The dam is raised in steps of about 600 mm. 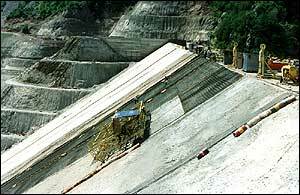 The edges are formed first, by making low concrete walls on the upstream and downstream faces of the dam. 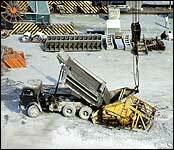 Concrete is then transported to the area between the walls and spread in a thin layer using bulldozers. Rollers are then driven over the concrete to compact it down. Embankment dams are constructed upwards in a series of thin layers. For each layer, the fill material is transported to the dam by trucks and dumped there. 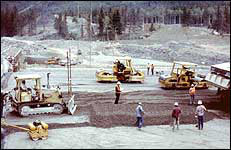 Then bulldozers are used to spread the material in a thin layer. The thickness of the layer depends on the material being used. Earthfill layers are about 300 mm thick and rockfill layers can be up to 1 metre thick. The layers are compacted down using rollers. When the dam has a core, that is also constructed in layers to keep it at the same height as the rest of the dam. 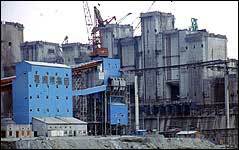 The reinforced concrete layer being placed on the upstream face of the Messochora rockfill dam in Greece. Once the dam has been raised to its full height, a protective layer is formed on its upstream face. This layer protects the dam against damage by waves, and sometimes provides waterproofing too.